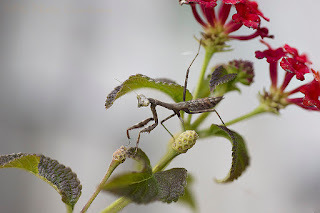 I captured this young Praying Mantis on the Lantana just about 2 weeks ago. It was found on a piece of metal and I took a couple of shots of it there and then I moved it to a more photogenic location. It was OK with me moving it and wouldn't even get off my hand at first. It finally did and then posed for me very nicely so I was able to get 4 images of it to stack together to bring out the focus of it's body better.